4" Mother Teresa statue made from durable resin. 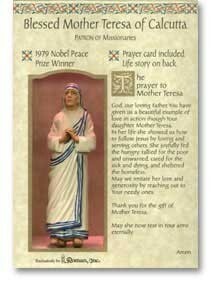 This resin statue is packaged with a prayer card recounting the story of Mother Teresa's life. Mother Teresa is beloved around the world for her charitable work and dedication to the poorest of the poor. Her life is an inspiring model of selfless love for others and of enduring devotion to Jesus Christ. She won the Nobel Peace Prize in 1979. Mother Teresa was beatified in 2003, and now holds the title of 'Blessed.' This resin Mother Teresa Statue is a wonderful reminder of the Christian duty to love and serve others. Just as Mother Teresa labored mightily to help others during her life, she can pray for us in Heaven. This resin Mother Teresa statue comes in a convenient gift box, making it a perfect gift for birthdays, baptisms, First Communion, Confirmation, or any other occasion. Blessed Mother Teresa's canonization to sainthood is September 4, 2016.